"Uncle" Spud My father, known to the Scouts at Camp Hinds as "Uncle" Spud, had gone on the journey the year before. Now Uncle Spud, as an experienced "Voyageur" was to be Commodore for this year's canoe trip. 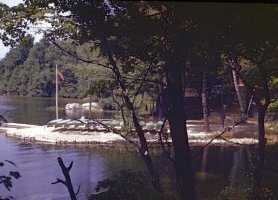 The 1947 season at Boy Scout Camp Hinds had come to a close and in late August twenty two Scouts and Scouters gathered at the camp to prepare for an adventure of a life time. All of us were well qualified in canoeing. 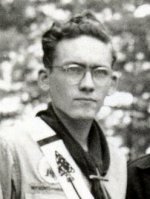 As for myself I was already an Eagle Scout, had thus passed Swimming and Lifesaving Merit Badges as well as Rowing and Canoeing Merit Badges. All of us had qualified as 'swimmers'. ChipmunkPoint On a bright sunny day, eleven canoes left Camp Hinds and headed out across Panther Pond. We paddled past Betty's Neck and then down Panther Run. We portaged at the fish hatchery and continued on into Jordan Bay. We slid past the southern tip of Raymond Neck and by noon time landed on Frye Island for a quick lunch and a short break. Finally rested and somewhat refreshed, we headed north on Sebago Lake. 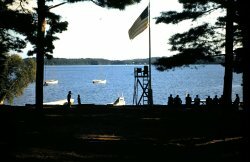 Our destination was Sebago Lake State Park where we would make our first night's camp. A few thousand yards from Frye Island a sudden storm hit the lake. This is not uncommon for Maine's deepest inland body of water. Suddenly my canoe mate, Phil Foss, and I noticed that when we were in a trough between swells. We were completely out of sight of the rest of our party. When we road up on the crest of a huge wave, we could at times see some of our group. Our required formation was as wild geese fly. Dad and Cecil Fullerton were in the lead canoe. Nine canoes were spaced out on either side, while behind the lead canoe the 'Old Timers' followed. They had also taken the trip the year before and now served as safety and control officers for our party. 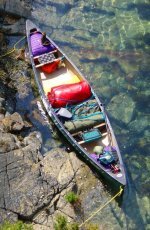 Phil and I were in a fourteen foot White of Old Town canoe and, like all the other canoes in our party, it was fully loaded with camping gear and provisions. We all knew that you keep down in a canoe and are thus able to negotiate rough water. This storm, however, did present a challenge. Dad realized that as the wind was with us it was useless to turn back. He then gave the order "Keep Going!" Our canoe proved to be a most worthy craft. There were a few times, that as bow-man, I was not quick enough to perform a cross-bow-rudder maneuver as we were hit by a huge wave. This caused us to ride up on the wave sideways. That canoe rode up beautifully and we didn't take on any extra water. Through the wind and rain and the ever threatening waves we plunged onward. As we neared the beach at the State Park we could see that the shore was lined with people, watching us and, I'm sure, praying for our safety. Just before touching land, Commodore Nason and Cecil held back, then they allowed a large wave to carry them far up the beach. They both stepped out on to 'dry' sand, pulled the canoe a bit further up the beach, then turned to help the next canoe come ashore. All eleven canoes reached land, much to the relief and cheers from the gathered crowd of onlookers. The Park Ranger was on hand to greet us. He told us that he had been at this State Park for many years and that this was the worst storm with such huge waves he had ever seen. Our safe arrival was due in part to luck, but canoeing experience and discipline played a big part. We quickly proceeded to set up camp, prepare the evening meal, and then bed down for a well deserved good night's sleep. Postcard of Long Lake The eleven canoes, now in single file, paddled up the Songo River. We portaged around the locks then up into Brandy Pond. We slid under the bridge at Naples and at the southern end of Long Lake beached our canoes. Here we took a break for lunch. Some of us took the opportunity to buy a few 'goodies' at the local shops and chat with some of the tourists who were milling around the village. At the designated time we returned to our canoes and pushed off for the return trip to the State Park. The "Old Timers", ex marines, were in fine physical shape. They both had special-made paddles with twelve-inch blades. I had seen them, when both stroked together, just about lift a canoe out of the water. Their wide blades played a big part in the next event. About half way down Brandy Pond, as each reached out for the next stroke, a sudden gust of wind struck. Those wide blades, acting like a propeller, spun their canoe over. A quick rescue was made and having lost only a few personal items, we continued on back to the State Park. That evening, after supper, a solemn ceremony was conducted by the Commodore and old timers. Based on the lore of the French fur traders of old, pine sprigs had been gathered in Naples. These were now shown to us "first-timers" as a marker of the furthest point in our journey. The red tips of the paddles were explained as representing the blood of wild creatures and fierce marauders who had attacked those traders, known to history as courageous and colorful "Voyageurs". They had, after all, paddled deep into the North American continent and eventually followed down the mighty rivers to New Orleans. Frye's Leap The next morning we broke camp for the last time. Following breakfast we set out on Sebago Lake headed for home. 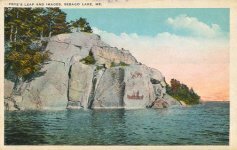 We silently slid past Frye's Leap where many years ago Frye had eluded death at the hands of pursuing Indians by leaping off the cliff into the lake. My father, Clyde E. Nason. Sr., was known to hundreds of boys at Camp Hinds as "Uncle Spud". He was on the Camp Staff for a number of summers. 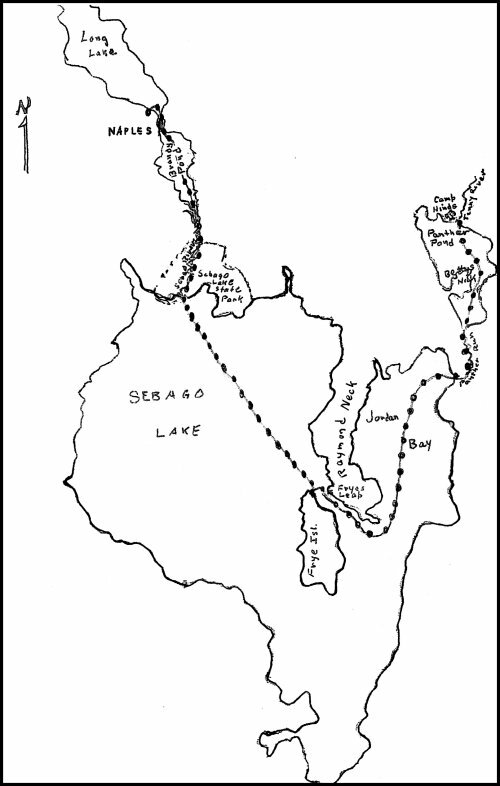 These canoe trips were under the auspices of Region One Canoe Trails (B S A). 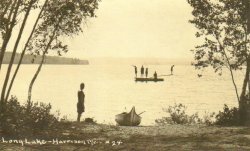 This program was based on the lore of the voyageurs who had traveled from the Atlantic, through the many north ponds, lakes, and streams and finally down the mighty rivers to New Orleans. 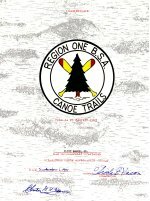 My certificate of completion of the "Wilderness Canoe Exploration course" is dated September 1, 1947. It is signed by Commodore Clyde E. Nason and by Chester G. A. Zucker whom, I believe, brought the Region One Canoe Program to Pine Tree Council. 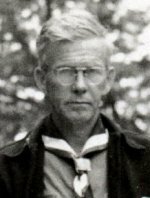 "Chet" was a Scout Executive and served on the Camp Hinds staff for two or three seasons. My father's canoe paddle and 1946 certificate are on display at the Pine Tree Scout Office museum.